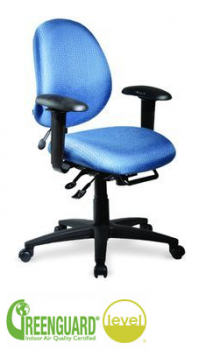 geoCentric Series: A comfortable solution for both dedicated and multiple office tasks, geoCentric chairs come standard with seat depth adjustment and ergoCentric's patented and easy-to-use 5" range back height adjustment system. Available in mid back, high back and extra high back options. Synchro: The geoCentric Synchro series is perfect for commercial applications such as data entry and clerical work as well as institutional applications including computer labs, library seating and study tables. The synchro mechanism includes synchronized movement between the seat and back rest and standard seat depth.